Southampton are reportedly eyeing a move for Juventus defender Rogerio, per The Mirror’s live transfer blog (January 24, 6:59pm). The Saints and Wolves are both said to be interested in signing the left-back, who is currently on loan at Sassuolo, with a £12million asking price mooted. Rogerio has been capped at Under-17 and Under-20 level by Brazil but has yet to make his breakthrough into the first-team at Juve. Indeed, the Brazilian spent last season on loan at Sassuolo too, and he also attracted interest from Newcastle United prior to their move for Jordan Lukaku, per Sky Sports. Southampton boss Ralph Hasenhuttl has yet to dip into the transfer market in January, instead choosing to trim his squad, with depratures including Manolo Gabbiadini to Sampdoria and Wesley Hoedt to Celta Vigo. It remains to be seen, however, if that will change with the arrival of Rogerio, with Wolves also reportedly watching developments. This all makes very little sense. Southampton are blessed with depth at left-back; Ryan Bertrand and Matthew Targett are already both vying for the spot on the left-hand side, while youngsters Kayne Ramsay, Yan Valery and Tyreke Johnson could all fill in there too if needed. The trio have shown in their first-team outings already that they have the ability to play if Hasenhuttl requires them to. 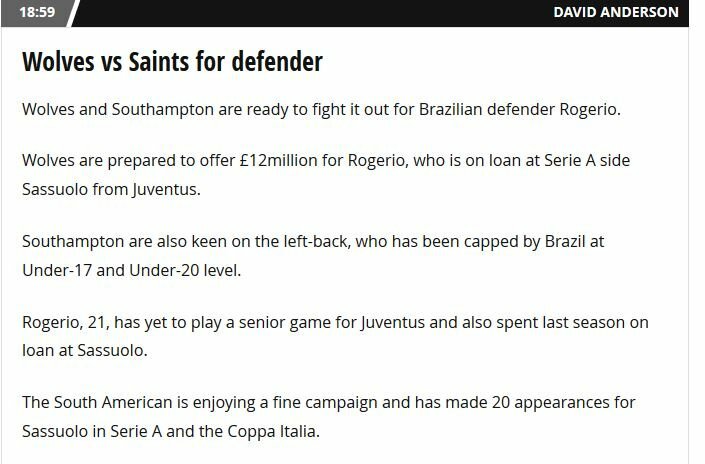 Bringing Rogerio in, then, goes against Saints’ strategy of bringing through their young players and there appears very little logic in adding a third senior left-back to the squad. Southampton would do well to bow out if they are indeed tracking the Brazilian and let Wolves have a free run at him. Quite simply, he isn’t needed at St Mary’s.